Okay, folks…here is a riddle that is in need of solving: what is painfully bloated, bombastic, loud, obnoxious and truly unnecessary in its return to the centre stage of hedonistic attention? No, it is not your insufferable drunk Uncle Chester at the annual family reunion picnic. However, if you had correctly guessed director Neil Marshall’s relentlessly absurd and hideously over-the-top comic book actioner ‘Hellboy’ then please give yourself a proud pat on the back. That is right…the burning behemoth is back to raise some flammable box office hell in this flimsy, furious furnace-based fable. The rebooted ‘Hellboy’ aimlessly rips and roars while reveling in its mindless mayhem as its animated selling point. However, this piece of pulsating popcorn pulp is triggered senselessly by bloody dismemberments, bad attitude, random empty-headed carnage and satanic-inspired silliness, all in an effort to produce flashy sensationalism for the sake of it. When all is said and done this cockeyed, combustible comicbook caper is a manic mess. Clearly, Marshall’s (‘The Descent’, ‘Tales Of Halloween’) rancid reinvention of the horned hellraiser pales in comparison to the beautifully orchestrated 2004 edition from Guillermo del Toro’s imaginative interpretation. Marshall’s careless corrosion of the Mike Mignola cult series for the indie Dark Horse Comics outfit simply does no favours for the mindless execution of this brutish, hellish headache. 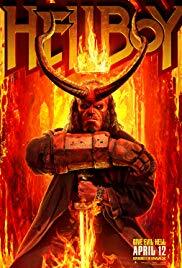 Marshall and screenwriter Andrew Cosby concoct what is basically an ignited, soulless slog of an actioner whose misplaced passion for the mysterious characterization of Hellboy is put on the backburner for the film’s tiresome, rambunctious supernatural shenanigans that feel more like a sledgehammer-swinging blunted blow to the nonsensical noggin. Essentially, Marshall’s version of ‘Hellboy’ extinguishes whatever creative sparks that were generated by the aforementioned del Toro’s inventive spectacle. The ragged script reaches desperately for every chance of tapping into the impish naughtiness in its take-no-prisoners ribaldry. Still, the peppered proceedings are nothing more than exhaustive, cringe-worthy vignettes that needlessly want to pummel the audience’s senses without any particular rhyme or reason. The heavy-handed gore in ‘Hellboy’ feels forced, more so than flourishing any kind of constructive madness that would distinguish the remaining elements of humanity from the inhumane tendencies. Grossly overwrought, ‘Hellboy’ is an overgrown, walking fleshy flame that cannot sustain its own high-flying heat. 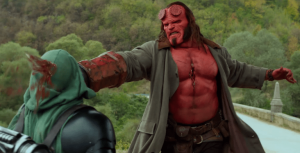 The excruciating antics of Hellboy is now being exhibited by David Harbour (‘Stranger Things’). Harbour’s anemic take on the massive red-colored rogue with the hardened rock hand that packs a convincing punch pretty much is reduced to quipping foul-mouthed platitudes. There is nothing remotely redeeming about Harbour’s mischievous, monstrous redballer that resonates with the recurring conflict of an outcast that needs redemptive validation in battling the inner and outer demons as he rescues the world from treacherous forces. In comparison, Harbour’s portrayal lacks the surprisingly layered psychological complexities of Ron Perlman’s wise-cracking beastly ball of fire in the previous installments. Whereas Perlman’s Hellboy continuously wrestled with his combative consciousness against the bombarded backdrop of destruction and decay, Harbour’s slight turn sluggishly exists in the exaggerated muck of the menacing happenings. The new Hellboy is employed by the secretive government agency known as the Bureau for Paranormal Research and Defense. Hellboy is the cliched cut-throat cop whose gigantic gun does the damaging on-the-spot talking and reasoning for him. Also, Hellboy’s adoptive father Professor Trevor Bruttenholm (Ian McShane) figures into the mix. Overall, the over-zealous and acid-tongued red-faced law enforcer is on hand to dispatch some jolting justice on the larger-than-life corrosive cretins out to do harm to the vulnerable planet. Yikes! The genuine horror that is reinforced comes from none other than the villainess vixen Nimue aka Blood Queen (Milla Jojovich from the ‘Resident Evil’ movie series), the wily witch from the 6th century that has come back to wreak havoc in the worst way possible. Of course, Nimue and her diabolical minions keep the harried Hellboy busy as he tries to eradicate these ominous planetary pests with all the frivolous fury at his disposal. Naturally, the sordid story gives Hellboy the convenient excuse to recklessly ramble and rumble through the boisterous baddies with all the allure of an errant wrecking ball crashing through a glass manufacturing factory. Thankfully, Hellboy is aided by determined partners Alice Monaghan and Ben Daimio (‘American Honey’s Sasha Lane and ‘Lost’/’Hawaii-Five O’s Daniel Dae Kim). Basically, ‘Hellboy’ goes through the madcap moments in its frenetic foolishness without once conveying any kind of legitimate cynicism for its beleaguered protagonist. Marshall force-feeds the film’s dizzying swagger with distracting guitar riffs and glorious patches of colour schemes that has all the subtle ambiance of a Deep Purple cover band jamming under a rainbow during an unexpected acid trip. The R-rated action sequences feel clunky and kinetically disjointed. The element of humour comes off as being laboured and lazy. Whatever ‘Hellboy’ mythology that was preserved from Mignola’s underground comics/del Toro’s flicks are now sacrificed for a boorish B-movie enamoured in its CGI-drenched juvenile gyrations. Gratuitous F-bombs, flashy set pieces and the heightened hysteria of a beast-like bad boy from hell cannot make for an escapist entertainment falsely grasping at stimulating straws. Harbour’s Hellboy seems more like a beefed-up, potty-mouthed frathouse boy overdosing on hot barbeque wings. Jojovich’s demonic diva Nimue is an enticing sight but does nothing more than direct traffic when commanding her acolytes to terminate the hotheaded Hellboy. She barely seems calculating enough to arm wrestle Cruella da Vil much less match wits with the husky fire-breathing incarnate. Here’s looking to finding a suitable firehose that can cool down the shoddy firestorm that is the baseless and bludgeoning ‘Hellboy’. « Black Moon Rising (1986) (Blu-ray film review).